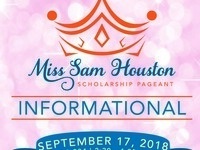 The SHSU Program Council will host a Miss Sam Houston Scholarship Pageant Informational on Sep. 17 from 3:30-4:30 p.m. in LSC 304. Any students interested in competing in the pageant can come learn about what all the pageant entails, ask questions, and attain an application. No RSVP is required and all interested students are highly encouraged to attend. For more information, please contact Program Council at PC@shsu.edu or at (936) 294-1763.